Read the reviews of guests who have stayed in our B&B in Agerola on the Amalfi Coast. Thanks to the reviews of our guests you will have the opportunity to discover something more about our structure. For us it is a matter of great pride and satisfaction to have the opportunity to share with other potential guests of the beautiful reviews, so that you can choose with maximum freedom and awareness. So I wanted to stay in Amalfi or Positano but it was just to expensive and parking to was costing up to 36 euros per night. So I choose Agerola based on price and proximity to Amalfi. A regular bus that costs 2e to take you to Amalfi. Having got there this was such a genius decision. That road down to Amalfi would be a nightmare to drive and if you have a hotel on the cliff you pretty much need to walk down as the buses coming from Agerola were full and never stopped. What a great stay. Lovely people with high quality rooms. Haidi and her husband was so hospitable and made our stay that more comfortable.A brilliant location minutes walk from the main Bomerano Bus station (where there is a tourist information office who speak English) and the Piazza. Where buses can take u to Amalfi and Napoli. There are also many great restaurants nearby. We ate our best meals in Agerola and visited pear and figs farms. I highly recommend this hotel and I can assure u you'll have a great, comfy stay with fresh made cake by Haidi for breakfast. Please note when you get near the hotel do not follow your sat nav but the road signs leading to Haidi House as sat nav stopped us 100 m away. We were absolutely delighted with our stay at Haidi House. Thomaso and Adelaide are wonderful hosts, so down to earth and a pleasure to be with. We booked a family suite, 3 teenage girls in one room, and a 13 year old grandson in our room. It was perfect, even with a shared bathroom. The house is immaculate. We stayed two nights and were surprised when we returned from Pompeii the first day to find our rooms made up and fresh towels. The views from the property are beautiful and the setting encourages a relaxing time. Breakfast was good, everything we could have asked for and more with a delicious flan pie of some sort with cherries. There is a nice restaurant (only takes cash and no ATM around) and a Gelateria just up the hill. Just down the hill (not within walking distance) there is a wonderful restaurant (Da Nicola) where we had the best time laughing with Gilda, and the food was excellent. We really wish we had stayed a while longer as I would have enjoyed chatting with Thomaso over a glass of grappa. The family of the house is so friendly and went out of their way to ensure we had a good stay with them. We had three people in a room with a double and twin bed and the rooms around us were empty which meant we had the bathroom to ourselves. There was a nice big balcony off our room with a great view of the mountains. The breakfast was amazing and it is on the doorstep of the beautiful Sentiero degli dei (Path of the Gods), which is an awesome walk with incredible views. The only challenge was that some of the plugs in our room did not fit either a European plug or old 3-prong Italian plug adapter, but this did not change our view of Haidi House - we would definitely come back! 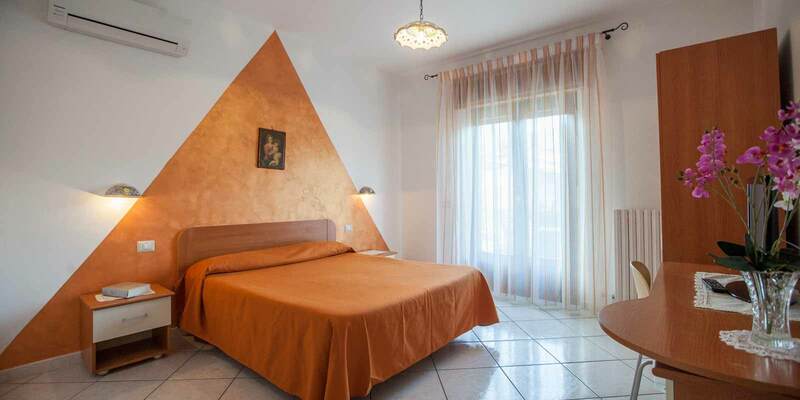 After having cancelled a room that I had reserved for two nights due to a cancelled flight, I called signora Adelaide to see if I could book the room again for one night since I had to meet relatives at Naples airport the next day. There were no more rooms available but if I still wanted to stay In Agerola I was welcome to stop by, once in town, and she would make a few calls to find a b&b for us. From the telephone conversation I gathered that I was talking to someone with an extraordinary, warm "simpaticona signora". She is exactly as described by many of the reviews that I read. After a delicious juice and what at times seemed to be a conversation between relatives, she took to phone and found us a very nice b&b in town but Haidi House is the place I would have preferred not only for the well kept immaculate rooms but I think signora Adelaide is the icing on the cake. we will try again next trip. We were there last summer and we very much enjoyed our stay there and also in Agerola. The bed and breakfast is owned by a very nice couple and we would definitely come again if we are in the area again. It is not too touristy there but you feel more like in a "real" Italian village. We were there by car which was perfect. Although the owners told us that it is also possible to travel around by bus. It takes some time to get to other places so you should bring some time with you as the Amalfi coast is very curvy (but you are on holidays anways). The owners told us that the area is a great hiking spot and we did climb up a mountain/hill and it was really nice. The views are just spectacular. The apartment was nice too, we also had wlan - they offer a sweet breakfast.